In a time when there is social unrest, political upheaval, and a general distrust of government, few artists have explored and questioned these issues at length. There is one group that has created a piece that brings awareness to the issue of war. An entire album's worth to be exact. Outward Bound is an art ensemble from Philadelphia that creates through the use of various art forms. In their latest CD, Prophecies of War, the narrative piece composed and directed by Andrew Hanna investigates the use of warfare in the 20th and 21st centuries and how it might be used in the future. As one might be inclined to believe, the title might suggest a religious theme or have religious overtones, but this is far from the case. Prophecies of War is a multi-artistic exploration into the realities and emotions that many feel before and during war. In live performances, as described in the liner notes, there is a visual element that is not present on the CD. On the CD, one will hear music that explores the emotional gambit and poetics that gives the listener a tangible means to the narration. The music is a cross between Tool and the 70s fusion of Miles Davis. At times the music takes on a psychedelic quality and it can become trance like. The guitar and bass offer heavy metal riffs that cross and fade with fierce drumming. Over top of this cacophony of sound is a emotionally charged melody delivered through a electrified saxophone. During the various movements, the band at times divides into separate entities where they do some collective improvisation. But in the end they return to a cohesive unit. Outward Bound is a ensemble that can be complex and simple with its improvisation and can do the same with its compositions. In addition to the rock and jazz influences mentioned, the title track has a classical influence. After some time this track begins to change into a entirely new composition, which lays the foundation for the 4th track. The music can become quite intense as in the last track when the proverbial destruction occurs and in the second track the mood is upbeat and heavily riff driven. In current times, there are few artists and groups that have created an art work that question the use of modern warfare. Outward Bound is one who has created a modern piece that question the use of warfare. Through Prophecies of War the audience experiences the realities of war. In the end, one is left with a emotionally charged artwork that raises insight into the use of warfare in the 20th and 21st century. 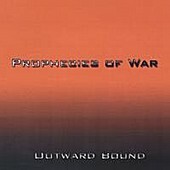 In the end, Prophecies of War is conceptually innovative and looks to break the boundaries of not only music, but the various art forms. It is on the vanguard of performance art. Rock, jazz, country, soul & more.